The Herschel Inspire is a premium infrared heating solution, bringing style and comfortable warmth to homes and offices. 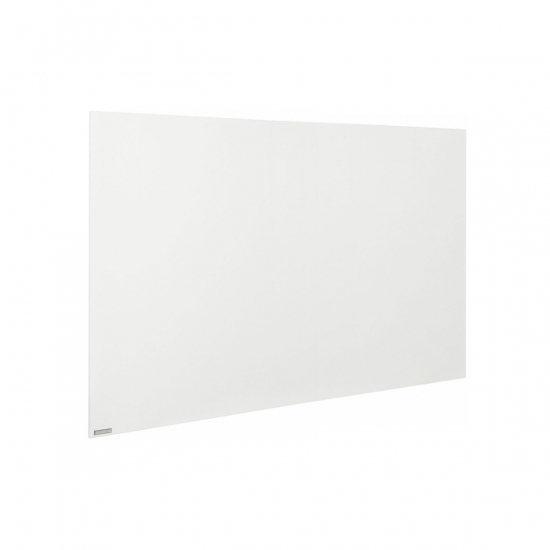 The 1200w infrared panel is ideal for larger rooms or open plan properties that require an effective source of heat. View Herschel Inspire datasheet here. View Herschel Inspire installation manual here. All our electric heating panels can be easily fitted with basic DIY knowledge. They simply screw to the wall and plug into a normal 13amp socket. Please note that Herschel Inspire panels are not supplied with a plug - you will need to purchase this separately and attach it to the cable if you want your heater to have a plug-in fitting. A template is provided to show you where to put the screws. If you want to mount the panels on the ceiling, they should be screwed to the ceiling joists or suspended in a grid with suitable fixings. If you prefer a discreet fitting with no wires showing you may want to have the panels professionally installed by a registered electrician. Herschel Inspire panels have an IP rating of IP54 so are suitable for use in bathrooms provided they are hardwired by a professional electrician. You must not use plug-in electric heaters in bathrooms or wetrooms. Always defer to the manufacturer’s guidelines about the bathroom suitability of any product. To ensure you get the most from your panel heaters we strongly recommend that you purchase a timer or thermostat for every panel. With thermostat control, the heater will automatically switch on or off to maintain the desired temperature. Thermostat control also allows you to set a different temperature for every room and programme when you want the radiators to come on and off. This small investment will ensure that you get maximum efficiency from your panels and minimum wasted energy. This panel has a heat reach of approximately 2.5 – 3m. We always advise consulting a qualified electrician before having multiple radiators or heaters connected to avoid overloading the ring main of your property. If you are at all unsure about the scale of your project, a professional will be able to provide in-depth guidance. All Herschel Inspire Infrared Panel Heaters come with a 10 Year Warranty. This item is available with free delivery. Please allow 1 ‚Äì 2 weeks for the item to arrive. Efficiency meets style in the Herschel Inspire range of white infrared heating panels. This 1200w panel is perfect for large rooms and open-plan properties that need a discreet yet effective heat source. A designer electric heating solution for homes, offices, hotels and public buildings. The Herschel Inspire White Infrared Panel sports a slimline design with an aluminium front panel and a sheet steel rear panel with easy-mounting points. The surface of the panel comes with a bright white powder coating and is designed to reach temperatures of between 85 – 95 °C. This is a little hotter than standard household radiators, but you can mount them high up on the wall or ceiling to keep them out of reach. If you’d like your heater to have a little more visual impact, the powder finish of the white Inspire can act as a blank canvas, allowing you to style its surface however you’d like. Just purchase some heat resistant paint and create your own unique work of art to match your interior design. Herschel Inspire infrared heating panels are easy to install as a DIY job. All you have to do is purchase a separate plug, attach it to the cable and mount the panel on the wall. Full installation instructions are provided. The panels can be mounted either horizontally or vertically: it will not affect their heat output. If you prefer a free-standing fitting, a set of feet can be purchased separately. To optimise the energy-saving potential of our panel heaters, we recommend that all customers fit their panels with a thermostat. With thermostat control, the heater will automatically switch on or off to maintain the desired temperature. With good insulation, this means the panels only use power for a fraction of the time – creating massive energy saving potential. They also allow you to set a different temperature for every room, if needed, keeping busy areas comfortable and avoiding wasting energy heating empty rooms. With thermostat control, infrared heating can be up to 60% more efficient than conventional methods of heating. We sell thermostats separately because our panels have a much longer lifespan than most thermostats and, with electronic technology always changing, we want to ensure you have a choice of the best thermostats available without compromising the lifespan of your heater. Infrared panels, like radiators, can be used throughout your house as an efficient and practical whole-home heating system. The main difference between radiators and infrared panels is that radiators heat using a combination of convection and radiation, and infrared panels purely heat through radiation. So why is this a good thing? Well, there are many benefits to radiated heat. Radiation heats directly: travelling out from the heater to warm objects and surfaces without raising the temperature of the air. This is more efficient than convection because you’re not reliant on filling a space with warm air to raise temperatures, which can be expensive to maintain if your rooms are large or draughty because the air must be constantly reheated. With radiation, you don’t need to heat the whole space; whilst convection always heats the ceiling first, because heat rises, with infrared panels you don’t need to heat the ceiling at all – you can direct heat at the living levels of the room so all the energy you use goes straight toward keeping you warm. Radiant heat is absorbed and then re-radiated from the objects and surfaces in your room, so the space becomes in effect a 360° radiator – luxuriously comfortable and very efficient. Warm walls and surfaces helps prevent damp, whilst no convection means no currents of dust moving around the air – a major benefit for allergy sufferers! The type of radiation used in our Herschel panels is called far infrared. This is the same type of heat given off by our own bodies – a gentle, natural heat which we absorb easily. Unlike sunlight, which includes harmful UV rays, far infrared is pure heat and totally harmless: in fact, it’s so safe, it’s even used in incubators for babies. For the perfect eco heating system, use the panels with electricity generated from solar panels for totally sustainable heating with zero carbon emissions.